The game had a very big importance for second-ranked Giants as it allowed them to take a leadership position. Giants defeated 5th ranked Shockers in Nassau 98-90. It ended at the same time the three-game winning streak of Shockers. Giants forced 23 Shockers turnovers. They looked well-organized offensively handing out 26 assists. 30 personal fouls committed by Shockers helped opponents get some easy free throw opportunities. It was a good game for the former international Michael Bain (185-85) who led his team to a victory with 26 points, 7 rebounds and 9 assists. The former international guard DShon Taylor (196-93, college: Norfolk St.) contributed with 20 points, 9 rebounds, 9 assists and 7 steals (went 7 for 7 at the free throw line) for the winners. Adam Johnson replied with 18 points, 8 rebounds and 4 assists for Shockers. Both coaches used bench players which allowed the starters a little rest for the next games. Undefeated Giants (10-0) have an impressive six-game winning streak. As mentioned above they are alone now at the top position. Shockers at the other side keep the fifth place with six games lost. Shockers will play next round against Defenders trying to get back on the winning streak. Giants will try to continue on its current victory against second ranked Stingers. It will be extra interesting game as Stingers is their local rival from Nassau. Another interesting game was a derby match between two teams from Nassau: Shockers (#5) and Mingoes (#3). Mingoes were smashed at home by 20 points 71-91 and even the fact of playing on their own court did not help. It ended at the same time the three-game winning streak of Mingoes. Worth to mention a great performance of Adam Johnson who helped to win the game recording a double-double by scoring 18 points, 14 rebounds and 6 assists and Rashad Woodside who added 12 points and 9 rebounds during the contest. The best for the losing side was Kemsy Sylvester with a double-double by scoring 32 points, 21 rebounds and 4 blocks. Both coaches tested many bench players and allowed the starting five to rest. Shockers have a solid three-game winning streak. They maintain fifth position with 6-6 record. Mingoes at the other side keep the third place with four games lost. They share the position with Rockets. Shockers will play against Defenders (#8) in the next round. Mingoes will play against Defenders (#8) and hope to get back on the winning track. Another interesting game was again a derby between two local teams from Nassau: Stingers (#2) and Pirates (#7). Stingers (10-2) smashed visiting Pirates (4-8) by 16 points 89-73. The winners were led by Eugene Bain who scored that evening 13 points and 9 rebounds. Stingers' coach used entire bench saving starting five for next games. Even 27 points by Kronoff Dean did not help to save the game for Pirates. Stingers maintains second position with 10-2 record having just two point less than leader Giants. Pirates lost third consecutive game. They keep the seventh place with eight games lost. Stingers' supporters look forward to another derby game next round, where their team will travel locally in Nassau to the arena Giants. Another interesting game was again a derby match of two teams from Nassau: Rockets (#4) and Pros (#9). Pros were defeated at home 71-85 and even the advantage of their own court did not help. The best player for the winners was Cordaro Pinder who had a double-double by scoring 15 points and 12 rebounds. Both coaches allowed to play bench players saving starting five for next games. Rockets (8-4) moved-up to third place, which they share with Bahamas Univ. Pros lost third consecutive game. They stay at the bottom position with 11 games lost. Rockets' supporters look forward to an exciting derby game next round, where their team will face at home their local rival from Nassau Regulators. Another interesting game was also this time a derby match between local teams from Nassau: Pirates (#7) and Pros (#9). Pirates (4-8) won against visiting Pros (1-11) 100-95. It was a good game for Christorr Stuart who led his team to a victory with a double-double by scoring 33 points (!!!) and 13 rebounds. Pros' coach tried various players' combinations and tested in total eleven players in this game, but that didn't help. Pirates maintains seventh position with 4-8 record. Pros lost third consecutive game. They stay at the bottom place with 11 games lost. Pirates' supporters look forward to an exciting derby game next round, where their team will travel locally in Nassau to the arena Regulators. In the last game of round 12 Defenders were beaten by Regulators on the road 98-83. The most impressive performance of 12th round was 27 points and 16 rebounds by Colton Albury of Pros. Another interesting game was a derby match between two teams from Nassau: Shockers (#5) and Mingoes (#3). Mingoes were smashed at home by 20 points 71-91 and even the fact of playing on their own court did not help. It ended at the same time the three-game winning streak of Mingoes. Shockers dominated down low during the game scoring 68 of its points in the paint compared to Mingoes' 42. Shockers forced 27 Mingoes turnovers. Worth to mention a great performance of Adam Johnson who helped to win the game recording a double-double by scoring 18 points, 14 rebounds and 6 assists and Rashad Woodside who added 12 points and 9 rebounds during the contest. Five Shockers players scored in double figures. The best for the losing side was Kemsy Sylvester with a double-double by scoring 32 points, 21 rebounds and 4 blocks and Romero Cornish (193, college: E.Wyoming JC) scored 13 points and 5 rebounds. Both coaches tested many bench players and allowed the starting five to rest. Shockers have a solid three-game winning streak. They maintain fifth position with 6-6 record. Mingoes at the other side keep the third place with four games lost. They share the position with Rockets. Shockers will play against Defenders (#8) in the next round. Mingoes will play against Defenders (#8) and hope to get back on the winning track. Another interesting game was again a derby match of two teams from Nassau: Rockets (#4) and Pros (#9). Pros were defeated at home 71-85 and even the advantage of their own court did not help. The best player for the winners was Cordaro Pinder who had a double-double by scoring 15 points and 12 rebounds (went 7 for 7 at the free throw line). Point guard Lerecus Armbrister chipped in 19 points. Four Rockets players scored in double figures. At the other side the best for losing team was Colton Albury who recorded a double-double by scoring 24 points and 10 rebounds and Judino Wilson added 20 points, 8 rebounds and 4 assists respectively. Both coaches allowed to play bench players saving starting five for next games. 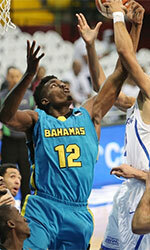 Rockets (8-4) moved-up to third place, which they share with Bahamas Univ. Pros lost third consecutive game. They stay at the bottom position with 11 games lost. Rockets' supporters look forward to an exciting derby game next round, where their team will face at home their local rival from Nassau Regulators. Another interesting game was again a derby between two local teams from Nassau: Stingers (#2) and Pirates (#7). Stingers (10-2) smashed visiting Pirates (4-8) by 16 points 89-73. Stingers dominated down low during the game scoring 60 of its points in the paint compared to Pirates' 34. They outrebounded Pirates 54-42 including 17 on the offensive glass. Great defensive blocking was one of the keys in this match when Stingers made 9 blocks. The winners were led by the former international power forward Eugene Bain (195-88, college: Bellevue) who scored that evening 13 points and 9 rebounds and international guard Abel Joseph (200-90, college: Holland) supported him with 14 points, 8 rebounds and 4 blocks. Stingers' coach used entire bench saving starting five for next games. Even 27 points by guard Kronoff Dean (173) did not help to save the game for Pirates. American Dominique Fernander (, college: Hobart) added 13 points and 7 rebounds. Stingers maintains second position with 10-2 record having just two point less than leader Giants. Pirates lost third consecutive game. They keep the seventh place with eight games lost. Stingers' supporters look forward to another derby game next round, where their team will travel locally in Nassau to the arena Giants. No shocking result in a game when sixth ranked Regulators (4-7) beat 8th ranked Defenders (1-10) in Nassau 98-83 on Saturday. It was a good game for Renardo Baillou who led his team to a victory with a double-double by scoring 17 points and 15 rebounds. Carlos Thompson contributed with 9 points, 6 rebounds and 12 assists for the winners. Forward Rashad Morley (198, college: Brock) replied with a double-double by scoring 14 points and 11 rebounds (went 7 for 7 at the free throw line) and Henderson Curry added 15 points and 6 rebounds in the effort for Defenders. Both teams had four players each who scored in double figures. Both coaches allowed to play bench players saving starting five for next games. Regulators maintains sixth position with 4-7 record. Defenders lost seventh consecutive game. They keep the eighth place with ten games lost. Regulators' supporters look forward to an exciting derby game next round, where their team will face at home their local rival from Nassau Pirates. The game had a very big importance for second-ranked Giants as it allowed them to take a leadership position. Giants defeated 5th ranked Shockers in Nassau 98-90. It ended at the same time the three-game winning streak of Shockers. 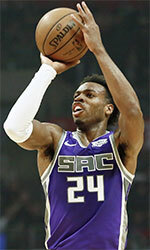 Giants forced 23 Shockers turnovers. They looked well-organized offensively handing out 26 assists. 30 personal fouls committed by Shockers helped opponents get some easy free throw opportunities. It was a good game for the former international Michael Bain (185-85) who led his team to a victory with 26 points, 7 rebounds and 9 assists. The former international guard DShon Taylor (196-93, college: Norfolk St.) contributed with 20 points, 9 rebounds, 9 assists and 7 steals (went 7 for 7 at the free throw line) for the winners. Four Giants players scored in double figures. Adam Johnson replied with 18 points, 8 rebounds and 4 assists and William Rigby added 20 points and 7 rebounds in the effort for Shockers. Both coaches used bench players which allowed the starters a little rest for the next games. Giants (10-0) have an impressive six-game winning streak. As mentioned above they are alone now at the top position. Shockers at the other side keep the fifth place with six games lost. Shockers will play next round against Defenders trying to get back on the winning streak. Giants will try to continue on its current victory against second ranked Stingers. It will be extra interesting game as Stingers is their local rival from Nassau. Another interesting game was also this time a derby match between local teams from Nassau: Pirates (#7) and Pros (#9). Pirates (4-8) won against visiting Pros (1-11) 100-95. Pirates shot 31 for 47 from the free-throw line, while Pros only scored fifteen points from the stripe. Pirates forced 23 Pros turnovers. Pros were plagued by 34 personal fouls down the stretch. It was a good game for guard Christorr Stuart (188) who led his team to a victory with a double-double by scoring 33 points (!!!) and 13 rebounds. American Dominique Fernander (, college: Hobart) contributed with a double-double by scoring 29 points and 10 rebounds for the winners. Colton Albury replied with a double-double by scoring 27 points and 16 rebounds and Ron Marshall added 16 points in the effort for Pros. Both teams had four players each who scored in double figures. Pros' coach tried various players' combinations and tested in total eleven players in this game, but that didn't help. Pirates maintains seventh position with 4-8 record. Pros lost third consecutive game. They stay at the bottom place with 11 games lost. Pirates' supporters look forward to an exciting derby game next round, where their team will travel locally in Nassau to the arena Regulators.